Before you begin to start looking to buy professional fishing boats for sale, you should know about all your choices. Though there is always the traditional, time-consuming option of going about looking through the different used boat listings and directories yourself, we believe there’s a better way. Used ship brokers use their resourceful techniques and industry relationships to match trusted sellers with interested buyers from across the world. Now with the entire professional marine industry connected through online channels, it’s easy to communicate across oceans to find professional fishing boats for sale matching certain criteria. Leading all of these such used ship brokers are our experienced and trustworthy USCG captains that make up our Florida boat brokerage firm. Since 1978, Ocean Marine Brokerage Services continues to commit our united efforts to make the process of buying used commercial vessels as painless and easy as possible. 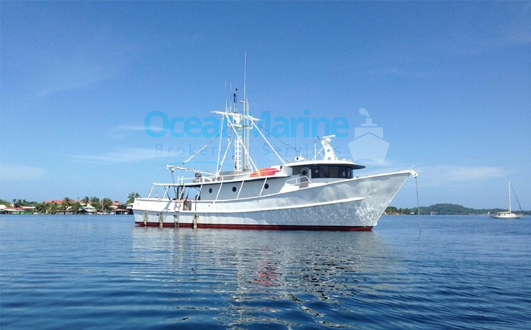 Our team of professional ship brokers have individual focuses that range in everything from professional fishing boats for sale (commercial fishing vessels, lobster boats, trawlers, shrimpers, crabbers, fishing charters, etc.) and passenger vessels to tugs, barges, oil field vessels, and a diverse variety of many more ship types. Together, we can hunt out decommissioned or unwanted used vessels for sale from every corner of the world. We even commit resources to help make the delivery of all these used vessels an easy venture that ends directly at the place of your choosing. The majority of our agents are retired United States Coast Guard captains that have accumulated decades of experience with all the things marine. We take a great deal of pride in our abundance of knowledge regarding both the vessels we have the opportunity to broker and their given industries. View our entire collection of used commercial ships for sale online to see if there is a listing that already meets your qualifications. You’re also welcome to contact Ocean Marine or call 985-448-0409 to speak with an agent directly about finding a number of choices in professional fishing boats for sale suited to your exact needs.